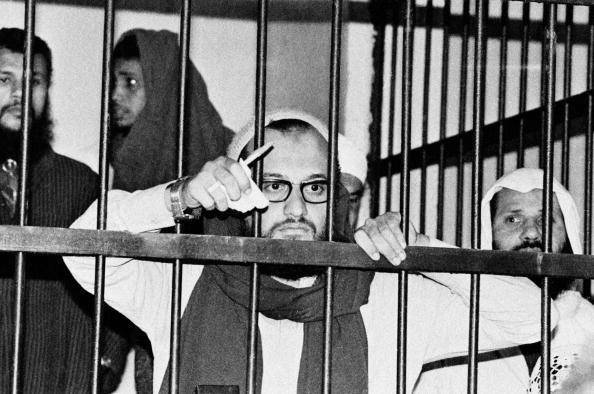 Astrology tells us that the assassination of President Anwar Sadat back in 1981 links to the current riots in Cairo. How so? I’ve just had some correspondence about national charts with one of the readers of this blog. It’s an interesting area. Some countries are so old and have been through so many changes of government that it seems almost impossible even to know what time to cast a chart for. For me, Egypt poses no such problems, despite its long and interesting history. I know the country well and I cast the chart for 7.30 am, July 23rd 1952, because that is when Anwar Sadat made the radio broadcast announcing the coup d’etat that deposed King Farouk. That was the birth of Egypt as a modern republic. Doubtless, the country will one day get rid of this regime and we will be able to create a new chart. So does this chart work for the “character” of Egypt and the current events? Egypt is powerfully Leonine with the Ascendant, Sun, Moon, Venus, Mercury and Pluto all in the sign of the Sun. Leo is a sign that is at once playful and authoritarian, like a small child. Any parent knows what it’s like to be at once the slave and the audience of a delightful five-year-old. That is the relationship that Egypt needs to have with the rest of the world. Everything’s lovely – as long as you play my way. And with it all packed into the 12th house, the power is hidden. For example, the United States may think it holds the whip hand with this regime because of all those billions of dollars in aid, but I think the truth is the opposite. The government of Egypt really steers that relationship, which, by the way it does not consider a partnership in anyway – more, “You give me what I want and I won’t scream”. What’s more, far from making Egypt grateful and cowed with all that cash, it has the opposite effect. The same result you get from showering a child with sweets all the time – a mixture of resentment and entitlement. With Venus and Mercury in Leo there’s a lot of charm here. Mercury so close to the Ascendant also speaks of a powerful voice, which is reflected in Egypt’s status as the film and music centre of the Arab World. The brightest star in Leo, Regulus, known as the royal star, is exactly on the ascendant. Egypt has serious glamour and brilliance. If this were a person, everyone would turn around and stop talking just to stare when he walked into a room. In a person’s chart, the New Moon often describes a mother’s boy or girl – someone who is unable and unwilling to grow up, to escape from the smothering influence of the dominant parent. I’m not saying all new moon people are like this but I have, quite often, seen this in the charts of people who never grow up. The child has to, metaphorically, kill the parent in order to live himself. Depending on the sign and house placement, this is more or less achievable. In general, people born with plenty of lion in their chart need to resolve their parental relationships even more urgently than most. Egypt’s New Moon in the 12th house suggests this parent/child dynamic is deep in the nation’s psychology. In the case of a national chart, a new moon suggests that the relationship between the people and the government is smothering. The government acts like a domineering, all-powerful parent suppressing the voice of the people. Egypt’s Leo stellium is in the 12th house of secrets, appropriate for a state controlled by the secret police (mukhabbarat), who are ubiquitous, brutal and scary. The power of the state (Pluto) is hidden and in Leo rather cruel. (Venus in the 12th rules the MC which represents the government also.) But this is a force that the government is unafraid of using. Mars is strong in its own sign of Scorpio, also suggesting a powerful military based at home. The Egyptian army is indeed evident everywhere you look on the streets, but its forays abroad have not been triumphant. That strong Mars also suggests that brotherhood, as well as being a child, is an important part of the Egyptian psyche. The idea of partnership between the people and the government, between men and women, between employers and employees is distinctly missing. Which brings me to the transits of now. Egypt’s seventh house of enemies, partners and friends, the house that balances against the “I” of the country begins at 29° Aquarius, but is mainly dominated by the sign of the fishes, Pisces. Right now, Chiron, the wounded healer, and Neptune are at 27° and 29° getting ready to go into Pisces. Just to give you an idea of how unusual this is: last time Neptune was here was in about 1847. Neptune is the planet of smoke and mirrors, illusion and deceit, glamour. Neptune on the descendant is a notorious indicator of tricky enemies, of the enemy within. In a person’s chart, it can be your own self who is the destroyer. Egypt’s Leo stellium is in the 12th house which belongs in the mundane chart also to Pisces, the sign ruled by Neptune. So right now it’s as if Egypt is holding up a mirror to himself and seeing the bad guy. In other words, the people and the government both see each other as the enemy. And there’s more Neptune involved. The country’s Ascendant has progressed exactly to sit on natal Neptune, suggesting a slow transformation of image. What the outside world sees may be far from the truth. We will get the Hollywood version of Egypt. Since the progressed Venus is also there, we may all think it’s absolutely gorgeous when it’s not. Venus also shows the women of the country, hidden while Venus progressed through the 12th house in the 50s, out from behind the veil in the 60s to the mid-80s with the Sun in the first house and then right back into the home since. Venus conjuncting Neptune suggests that the idealisation of Egyptian womanhood may reach some kind of hysterical spiritual pitch right now. One of the distinguishing features of this Egyptian Intifidah is the participation of women (as well as the largely middle class protesters). For a foreigner in Egypt, the dearth of women in public spaces is usually striking. However, women are not empowered by this uprising but used as potentially symbolic. Chiron’s presence in the mix, on the descendant, suggests that this uprising is a reworking of a past relationship that may bring about healing. The angle of government in Egypt’s chart crossed the planet of revolt about five years ago and interestingly, this uprising, though larger, is part of a much bigger sequence of events. Since 2004, Egypt has had at least 3,500 collective labour actions. All of which have been squished, of course, but that represents millions of workers taking direct action. There were also bread riots in 2008, again successfully quelled by the police state. As a nation, Egypt is having it’s second Saturn Return, the time when the old man of the solar system returns to the place he was when the country was born. This happens about every 29 years and the message is always clear: grow up. So what happened last Saturn Return back in 1981? 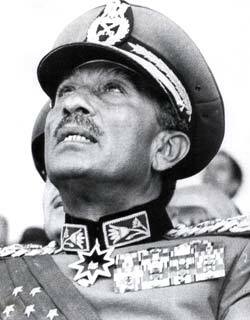 President Anwar Sadat was assassinated by his own troops while watching a military parade. If I were President Mubarak (or in his circle), I’d be very careful indeed right now. The rioters are not your real enemy, he (or she) is right next to you. Just to remind you, Sadat’s killers were the first “Islamists” to make front page headlines around the world. Just think what’s happened in the intervening 30 years. Will the Egyptian people be able to escape the control of their whimsical, tyrannical parent, sorry government, and replace it with something fairer, freer and frankly more fun – because this last must be important with Mercury in Leo on the Ascendant. There is opportunity here – with the Saturn Return and the progressed Uranus. What’s interesting about Egypt’s natal Saturn – the planet that connects us to our history, keeps us stable, gives us boundaries, makes our rules – is that it is exalted in Libra in the second house of money. Libra is the sign of fairness and partnership. This suggests to me that the way forward for Egypt is to find some way for Egyptians to start feeling that they and the government are working in tandem. At the moment, all the money and all the power are concentrated in the hands of a very few. The people have a really difficult time ahead if they want regime change. This is a very fixed chart. There are no mutable planets at all, which suggests that when change comes, the whole country may shatter and have to be rebuilt. The government will not let go of power without a serious brutal fight. But in 2012, Uranus, the planet of change, opposes Egypt’s natal Saturn and that’s a likely moment for this regime to fall. You need to keep pushing, be careful who you trust, get organised, create partnerships and get ready to seize the opportunity when it comes. In four years or less, Egypt is due for a new dawn, when the MC progresses to the Sun. (I hope that doesn’t just mean that Mubarak junior takes over, which on the grimmest reading it could.) Meanwhile, things could get nasty. Apologies for the horrible typo in the first line – now corrected. Looks as if this 1952 chart for Egypt really tells the story. Gloomy and sobering reading. Thanks for your insights. I think you’re right about the need for effective change to be shattering. It’s tragic, but there you go. Egypt’s time for hereditary leadership is clearly past, and Mubarak jr. is not the person for the job anyway. Indeed, a fascinating take. You address the essential childishness of the average Egyptian in a complex and interesting way. I used to say (having lived in Cairo during the Sadat years) that I had better success treating any Egyptian I had to deal with as though he/she were like my eldest kid when he was 2 2/12 years old. A colleague whom I accompanied to Cairo on a business trip some 15 years later remarked that my voice took on a surprisingly commanding tone whenever I spoke to an Egyptian. Maybe it was left over from living there. I have to say, I agree: consider that a frequent theme coming up over and over in radio comments from Egyptians (at least, on my local public radio station) is that of ‘Egyptian pride’ / national pride. What’s a Leo without his ego, I ask you? I’ve looked at a lot of astrology about egypt over the last few days and I have to say that yours is the best psychological profile of the place that I have read – and I do know the country. But I notice that there are various different charts doing the rounds. How did you choose yours? Clearly, there can’t be a horoscope for the original founding of a nation so ancient as Egypt, so we’;d have to look at modern times to decide. first I checked to see what Nick Campion recommends in his Book of World Horoscopes, which as you probably know, the ur-text for these things. He has four possible suggestions. Two in 1922, one in 1953 and one in 1952. Since I know a some modern Egyptian history, I rejected 1922 immediately. That was the so-called proclamation of Egyptian independence, something of a British PR stunt. Egypt remained essentially under British control although not in name. So it had to be 1953 or 1952. Any Egyptian school child will tell you that Gamal Abdel Nasser and the Free Officers staged a coup in 1952 that saw the end of the Muhammad Ali dynasty, completely peacefully. King Farouk was allowed to sail off in his yacht. They even gave him a 21 salute as he left Alexandria for the last time. So Egyptians date their liberation from the Ottoman dynasty from 1952. Campion uses 11 pm on the 22 of July. This is pretty much the chart I have but I chose to set it for the radio broadcast to the nation on the following morning because that announcement was the real birth of the Republic. It’s the pivotal moment in the history books. So I guess the short answer to your question is: I looked at the modern history of the country..